We are having a bit of a rough time readjusting back to Rockville time. I was worried that I would spend a lot of time jet lagged in Italy, but I shouldn't have worried about that, I should have worried about this week back in my own house. Edda is still crashing early and getting up for good at 3 am. I've been sleepy at odd times (which has meant a slowish ramp-up to my regular working-at-work speed) and I've been fighting a lingering cough for at least 5 days now (which in my pessimistic mind means I have TB because I have to go next week to get my annual TB test for nursing school). Also, I had a terrible stomach bug - which instead of the usual 24-hour variety - I got the 2-hour variety last night. That whole intestinal debacle ended up with me sleeping in the bathtub at from 3-4:30 am (somehow the coolness of the tub was a relief), but I felt well enough today to eat all my meals and hold on to them. That terrible stomach bug was so short that I almost think I dreamed the whole thing. But Edda caught it and got sent home from camp today (they showered her twice within 5 hours). Poor Edda. Poor camp counselor. It's quiet in the house without Vince. I hope he doesn't have this stomach bug. I haven't heard a peep from him, he's out of cell range and anyways, I think they ban electronics at scout camp. This selfie he took? He looks like he's 25 years old. 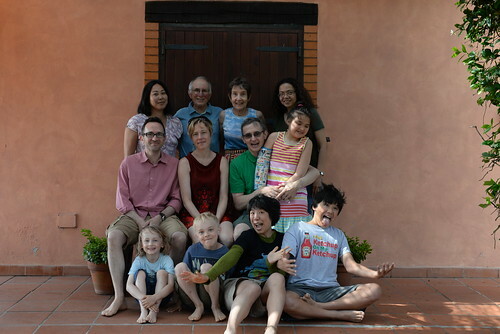 A few loose ends to tie up about Italy - there was a family photo. The above one apparently only Vince and I got the message that it was suppose to be a silly photo. I went to the thrift store before we left the US to procure a couple of jigsaw puzzles. I didn't have very many choices for puzzles, so I selected a Robin Hood themed one with 1000 pieces for $4.50. It turned out to be one of the hardest puzzles I've ever done. The shape of the pieces was not unusual, just the printed picture was detailed and small and quite similar all over. 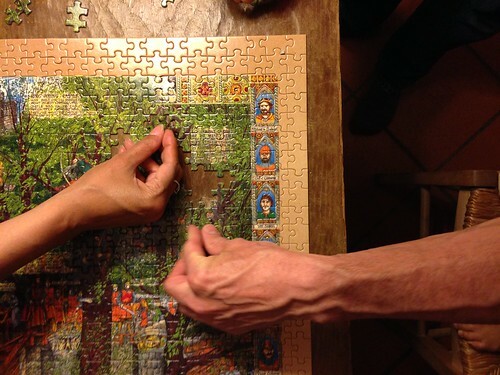 Mid-vacation, it was unclear if we would be able to finish the puzzle at all. 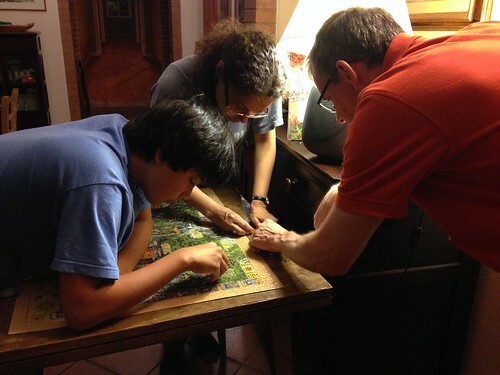 Louisa loves puzzles - here we are at 10:15 pm the night before our 9 am international flight putting the final pieces together. We arrived 2 hours before our outgoing flight and we needed every minute of the two hours to navigate through the airport. First was finding out that the NYC flight was in a terminal that required a bus trip. Second was declaring that our three water guns did look like guns, so those had to be routed through a different security line. 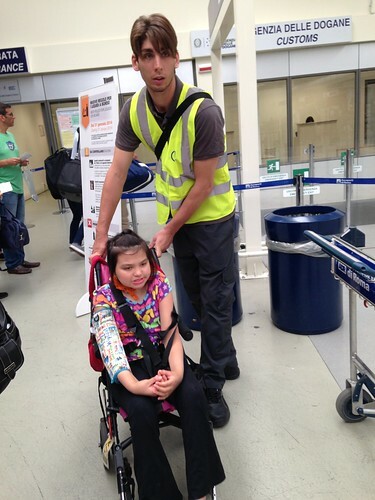 Third was that Edda needed a personal wheelchair pusher to get her through the entire airport from check-in all the way to the plane. Why? We don't exactly know why. But Edda's personal assistant was male, young, cute and oh so very polite. Che carini! 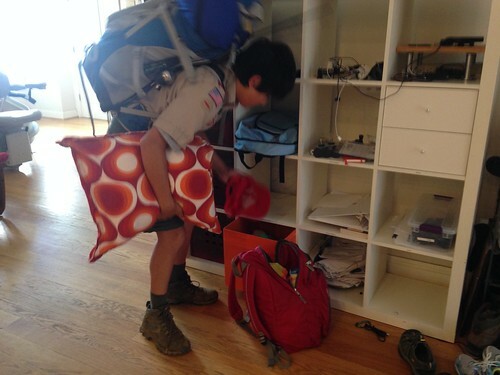 Vince left this morning for a week-long scout camp with his prescriptions for his double ear infection. Oral antibiotics for his middle ear infection in one ear, drops for the outer swimmer's ear infection. And instructions to not go into the water until Wed. At scout camp, they work on getting some merit badges and Vince had signed up for life saving and snorkling, so those had to get switched over to shotgun and pottery. Our Italian vacation! 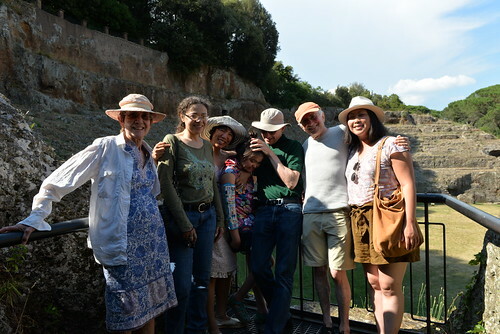 We went to Rome for the Martin vacation to celebrate Bob and Katherine's 50th wedding anniversary. 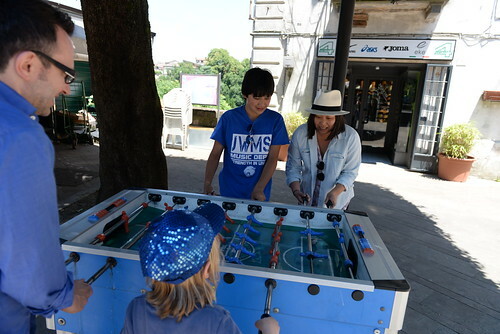 If one asked them why they picked Rome, they would say that Vince requested to see Rome (he studied it in school this year). It was also helpful that Ben, Jeremy's brother, is fluent in Italian. 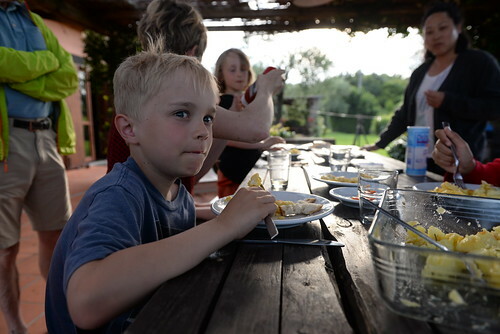 It is a rare thing for the four Martin siblings to be together in one place, especially since Ben and his family live in Sweden - it was helpful that this trip was in Europe so that their shelp was the short one this time. 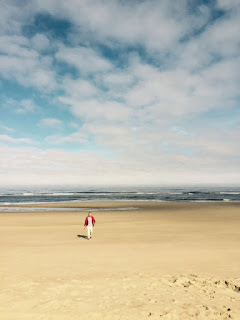 Forgive me, sometimes I think vacation recaps can be tedious because I believe travel is a tricky subject to write about because it's a lot of logistics and waiting and petty frustration punctuated intermittently by great sights that 4-5 million people see every year, but you see only once in a lifetime. 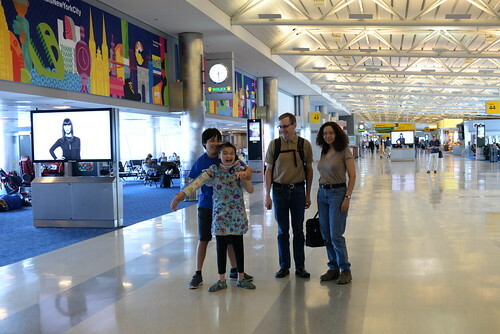 Here we are - the DC contingent (us + Jeremy's sister, Louisa) - at the JFK airport ready to leave. 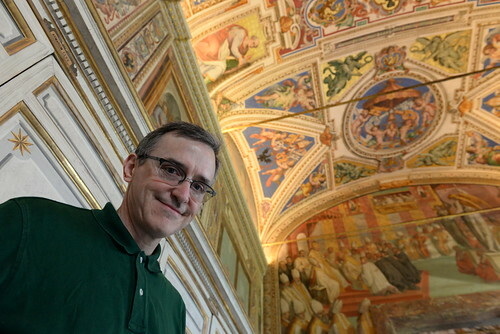 We drove the four hours to JFK to get a cheaper and direct flight to Rome. Otherwise, we'd have to do layovers in Europe at 1 am EST time which just would seem tough for everyone, especially Edda. Little did we know that the outgoing flight would end up to be the low point of the vacation. 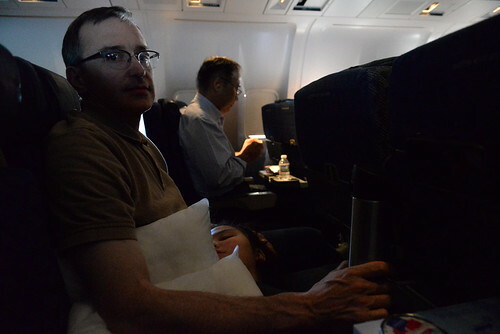 We had three center seats, Edda in the middle, flanked by both of us. We left at 6 pm ish? She was fine until 8 pm and then it was suppose to be bedtime. 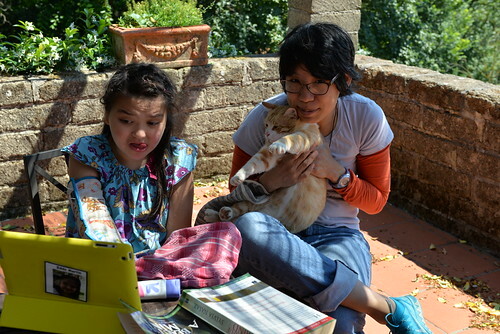 Her head rested on Jeremy's lap, her feet on my lap. For the next three hours, Edda yelled and kicked. We tried all the tricks - movie, extra juice, singing, etc - no dice. We totally disturbed the 200 people in the cabin who were trying to sleep, I was kicked in the gut for three hours, Jeremy had a little (OK, maybe she isn't so little) wailing Edda less than 18 inches from his head. I had to put a blanket over my head so I didn't have to look at Jeremy or anyone else giving me the evil eye and listen to some zen podcast. Anyways, next time, I told Jeremy, we need to get sedatives (for us? or for Edda? maybe both) and 200 pairs of earplugs for our fellow travelers. 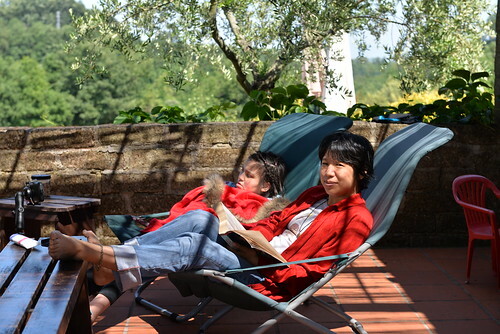 But here we ended up, on a porch in Capranica, Italy. Beautiful weather, beautiful house. Feeling relieved, hopefully the vacation can only improve from here on out. I guess that's the good thing about the worst thing happening first. 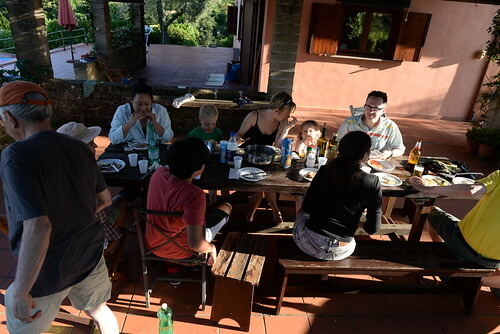 We were slowly joined by Bob, Katherine, Emy, Ben, Ruben, Johanna and Felix. 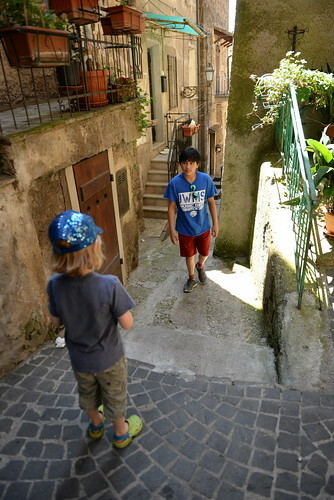 We spent the first afternoon exploring Capranica. The light was incredible. All the things you imagine an Italian village to have? It's all true. 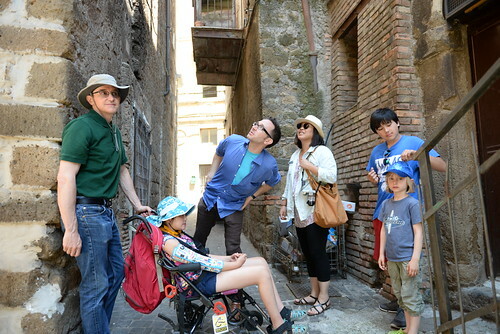 Little cute alleys, resident cats, cobblestone streets, impossibly tiny cars and gelato at cafes? All there. 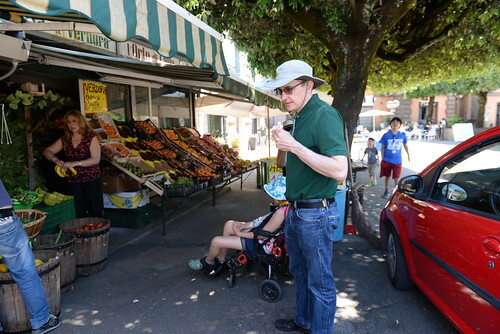 It's fun watching Ben speak Italian to the local residents to find directions or ask for help. 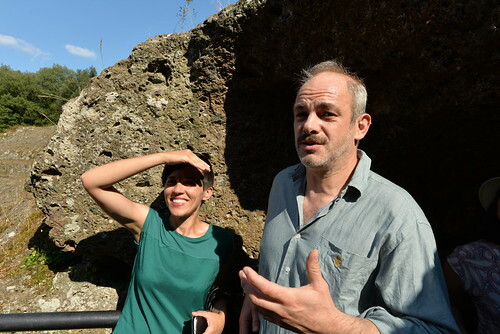 Italian is a lovely language to listen to and Italians like to talk - Ben would stop to ask for the nearest cafe or something and then we would just stand there and watch him talk for 10 minutes to a random person. Fruit stand - look, don't touch. The fruit stand guy bags all the stuff for you and will talk to Ben to him for a long time about the name of donut peaches. 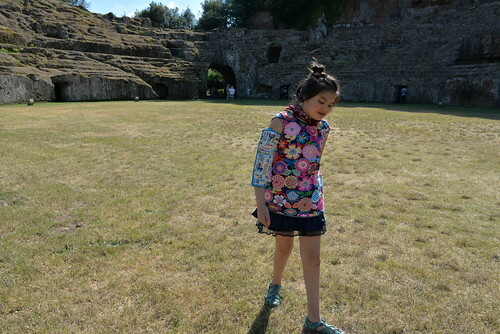 Edda exploring the ancient amphitheater in Sutri - we followed Ben's friend Andrea to this sight. Ben's good friend - Andrea and his girlfriend Anna who recommended our accommodations to us and were gracious hosts - showing us the town. 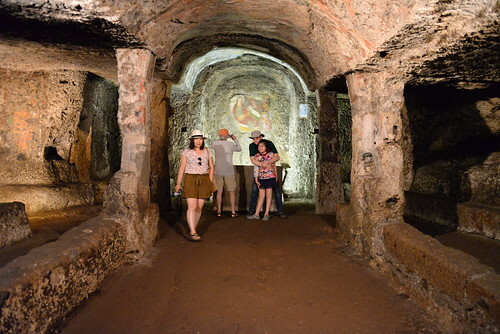 Etruscan tombs in Sutri complete with stories of sacrifices and images of blood running down ceilings and floors. 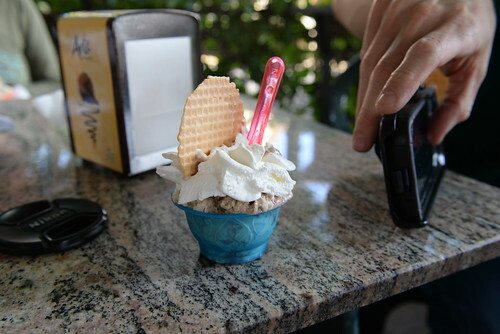 Gelato - I did have gelato numerous times, but the first time was the best! Tiramisu for Edda. 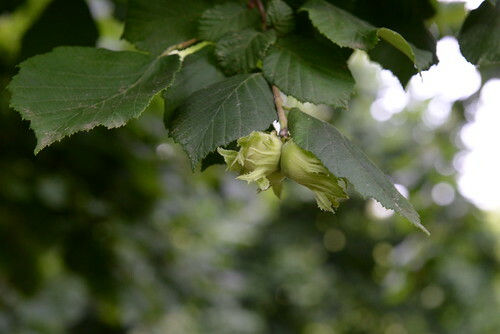 Andrea's family has a hazelnut farm in the area - this is what a baby hazelnut looks like before it turns into Nutella. And many, many hours in the pool. So many hours that by the end of the vacation, Vince had a nasty case of swimmer's ear. 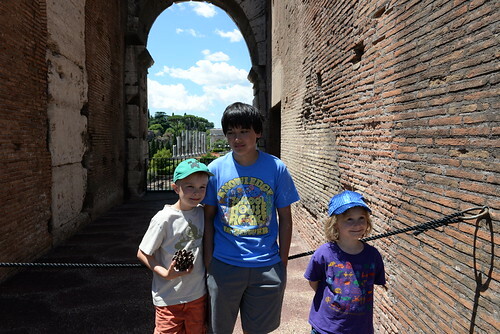 Sunday was the ambitious day - off to Rome to see the Colosseum and the Roman forum. I went with Vince and the Swedes. 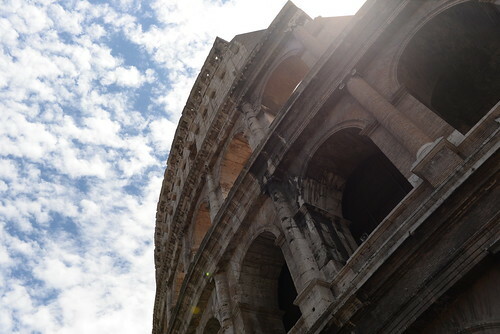 Here's my shot of the Colosseum that has been taken by million of other tourists. Ben is full of historical tidbits that he wants to share. I know nothing about Rome, so I was happy to listen to them. The most interesting thing that I learned was that the Colosseum was covered in beautiful marble and that it was all stolen to make other things in Rome - so the Colosseum today (as massive and as incredible as it is) is only a a shadow of it's glorious old self covered which was covered in white marble! 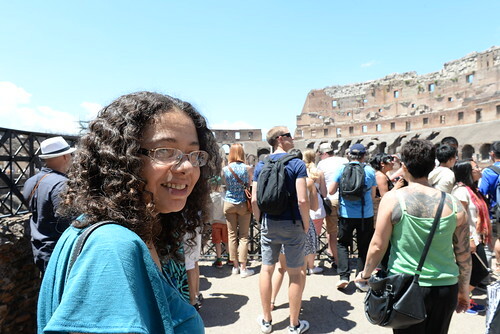 And they could get 50,000 - 70,000 people in and out efficiently (to which Ben grumbled about when he contrasted that to our haphazard and confusing way of entering the Colosseum via the standard tourist lines). It was really hot. The kids did lose patience as the day went on. Vince was perhaps the worst one of all - maybe you can see it in this photo. 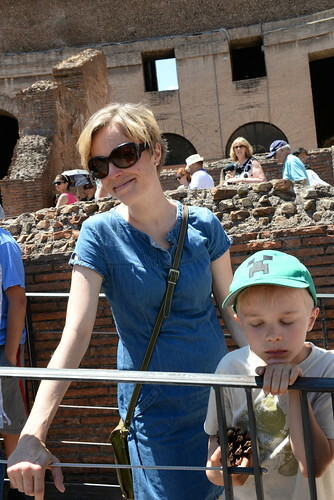 We did meander through the Forum, but it was too hot for me to take photos. At the turtle fountain! 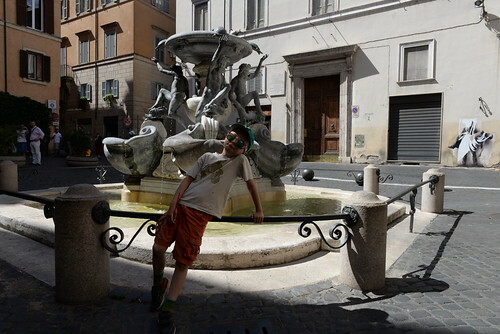 According to Ben - the cutest fountain in Rome. 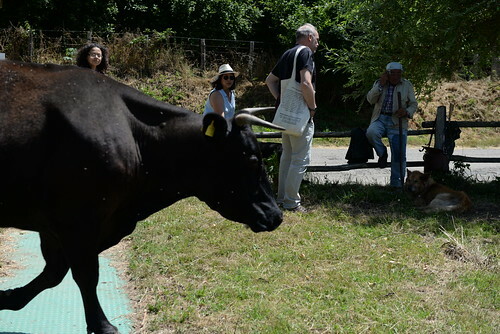 The next day, we went to a bird sanctuary where we ran into an Italian shepherd and his herd of cattle. Then we went to a lake for swimming. Edda's a little nervous about the idea. One of the things that Vince really wanted to do was to host a dinner for the whole family. 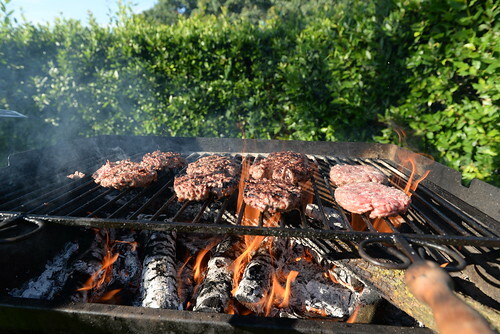 He planned and cooked a burger/grilled veggie dinner that was excellent. 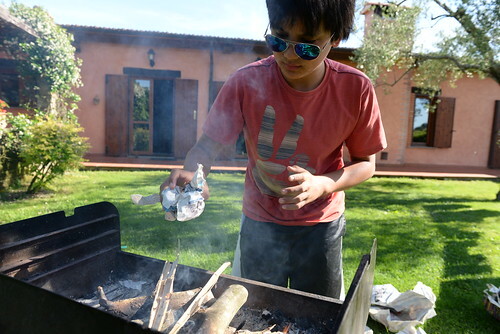 Sometimes I think he wants to host dinner just so that he can light a fire. 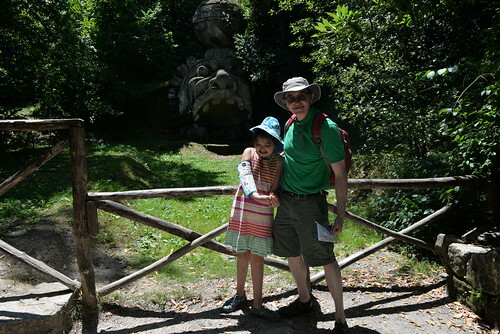 The following day, we went to the Gardens of Bomarzo. We called it the Monster Garden. If you look closely, you can see the gaping maw of the stone monster behind Edda. This was the place when Vince's ear really started to hurt. We had to detour to a pharmacy to get some ear drops for Vince. 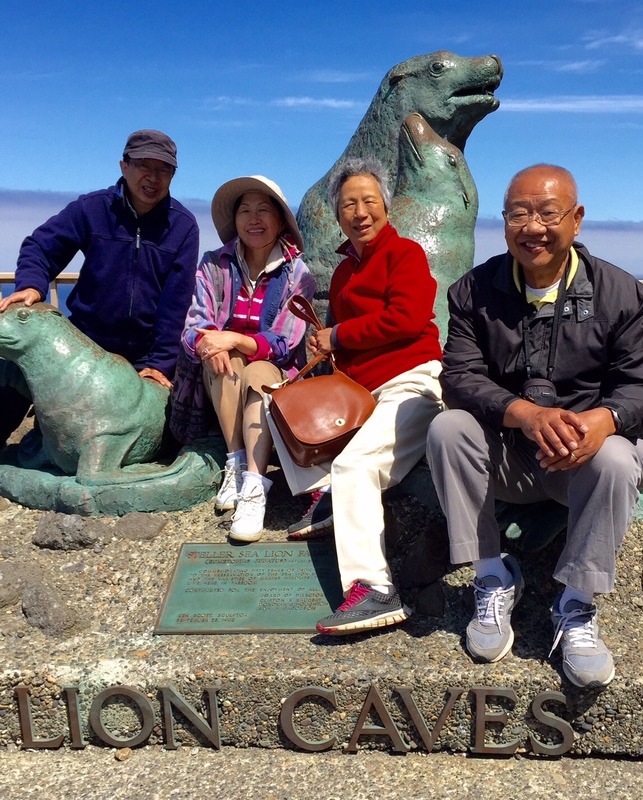 After the monster park, we headed home for an early dinner, the Swedes were scheduled to fly out the next day. Vince was cold, but I could only find this red, sequined, fur trimmed sweater of Edda's to wear. While the Swedes headed home, we headed back to Rome. One of the things that made me anxious about this trip was trying to figure out what Edda could or could not manage. I don't like feeling like she's missing out or being left behind. 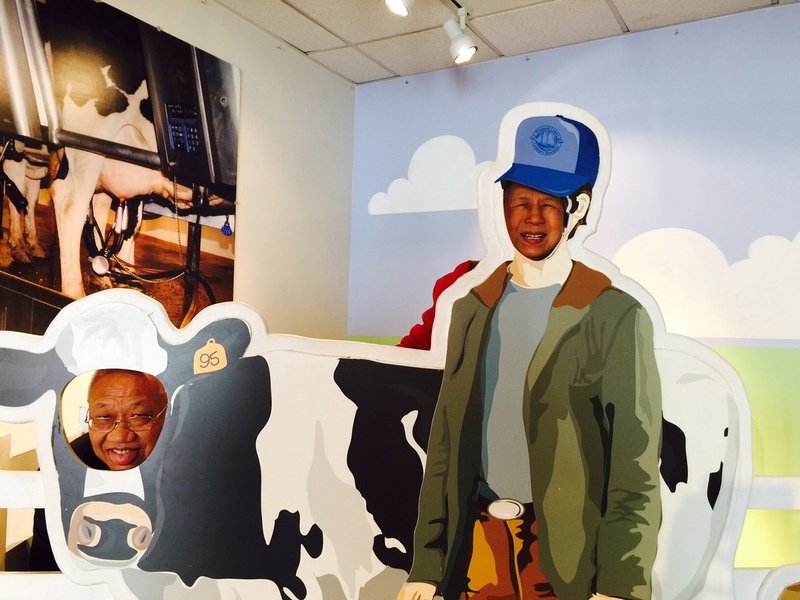 Jeremy and I talked about this for weeks, how to make this trip both fun for Edda (and me! and therefore everyone else) and not too restrictive on everyone else's activities. 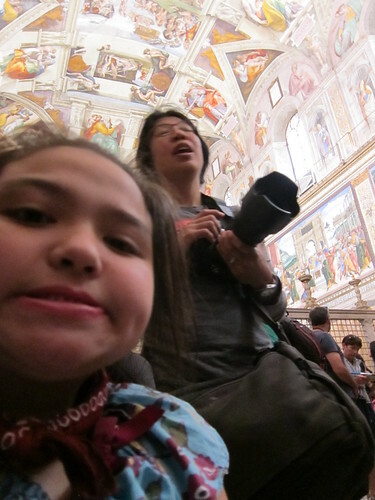 Anyways, we settled on taking Edda to the Sistine Chapel as our most ambitious Roman goal for her and for us. 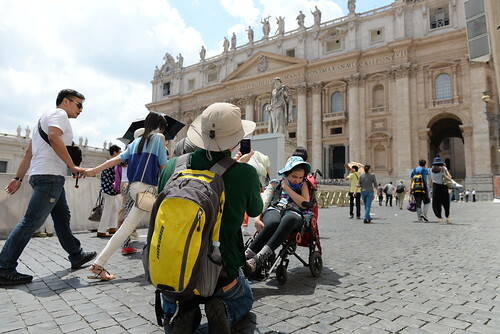 By this time, Vince was moody and sick with an ear infection, so we didn't drag him to the Vatican, but it was so beautiful, I almost regret not making him come. The Catholic Church really knows how to put on a good show. Edda - she had a good day in Rome. Because of her, we skipped all the lines at the Vatican and at St. Peter's. We didn't have to stand in the hot sun for hours. 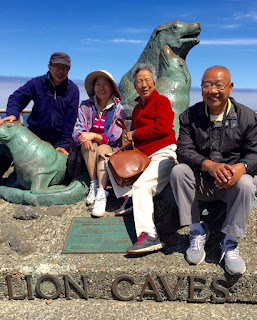 The elevator access and stair lifts and mysterious gates that could be opened for us were a little hard for us to navigate (and we often found ourselves swimming upstream through the vast number of tourists going downstream), but they were there and we saw a lot. We weren't allowed to take photos in the chapel, but I think Jeremy fired off this one before we realized the restriction. And we got home! The home flight was fine, Edda fell asleep peacefully an hour into the daytime only flight. We came home to all the things one comes home to - a stack of unread mail, loads of emails to reply today, prep for camp for both Vince and Edda, and the end of the work quarter for me. Everything electrical is done except a three-way switch. It doesn't work quite right. Will check today. Mom will call for inspection on Monday. Mom and I went to "Habitat" to buy some donated-cabinets for the old laundry room and a two-dollar land-line phone for our new addition. 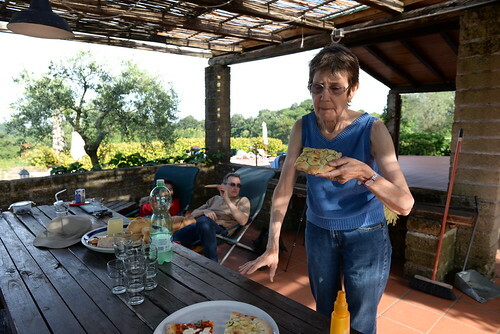 We are back from a week in Rome to celebrate Bob and Katherine's 50th wedding anniversary. More photos to come and a full recap for those interested. With electricity in Mud Room, Master Bed Room, Bath, Hood and Outdoor, I have completed all but the Master Bed Room. I am going to install three lights in our old crawl space to add light when doing the plumbing rough-in. Next week, the electric work, I believe is ready for inspection. I have also to install two land lines for telephone and cable connection. Today, the lines between electric sub-panel and all five GFCIs (Ground-Fault Circuit Interrupter) are hot (with live electricity). These five GFCIs will then take load from Mud Room, Bath, Master Bedroom, Exhaust Hood and Outdoor and crawl space lights respectively. This way, the electric sub-panel can be closed. Working on each above mentioned individual area can then be done by just opening the its relative circuit breaker. Pretty convenient and safe this way. Since the addition is with live electricity, I also installed a temporary fire alarm at the very top of the inside roof. It will be taken down when doing the insulation and drywall. After all finish, it will place at the top of ceiling instead. Tomorrow, I will take a break on electric work and working on telephone land line & cable outlet in our addition. Several days ago, we took a short trip to Crater Lake & Oregon coastal areas such as Sand Dunes National Park, Sea Lion Caves and Tellamook Cheese Factory. 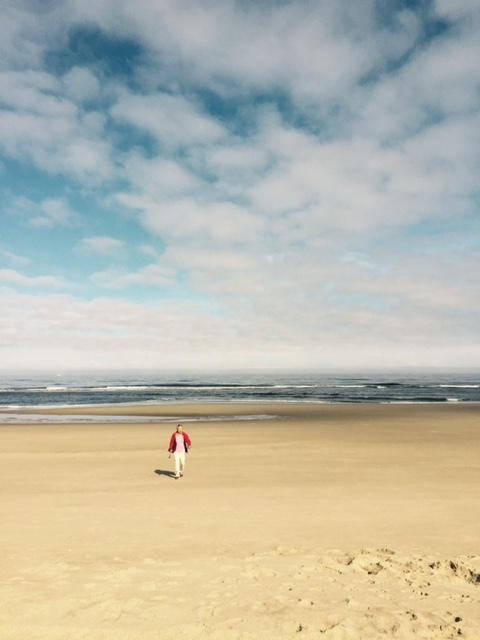 It was a nice and short trip. 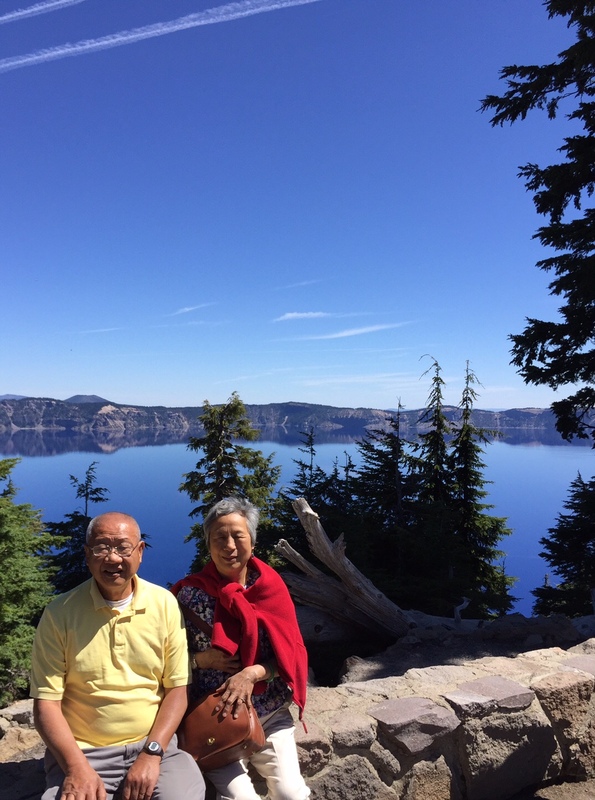 We are planning to go to Japan, Korea and China during this Fall Season together. 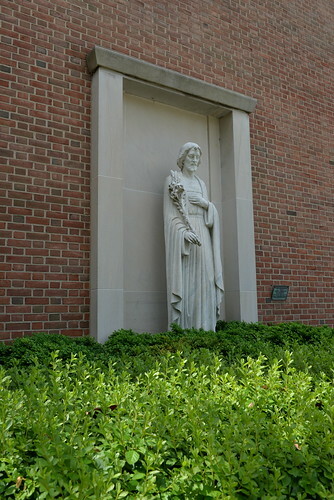 Outside the Nursing School at Georgetown University. 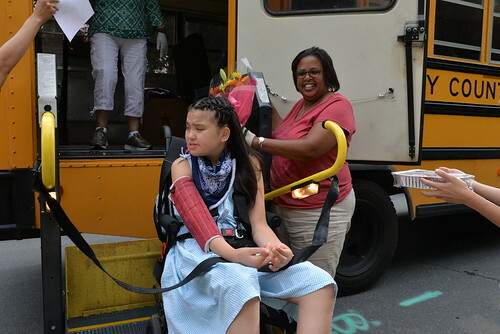 Today was Edda's last day at her elementary school. 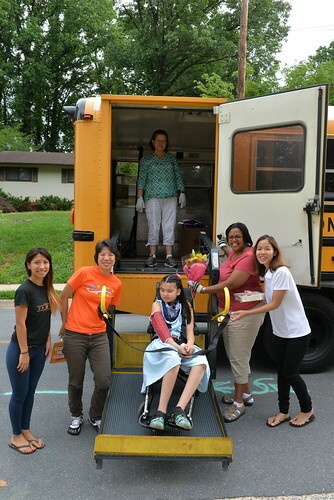 Ms. Carmen and Ms. Maria have been driving Edda to school for five years. 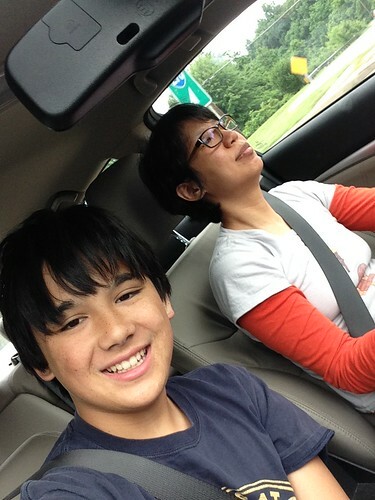 It's unlikely that they will be driving miss Edda to middle school next year. boo. 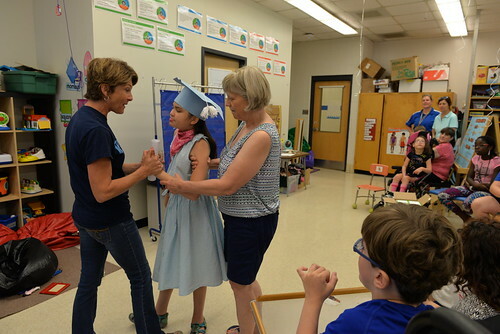 A few hours after the bus left, Jeremy and I went to Edda's classroom to hold a graduation party - her classmates, friends and teachers all assembled and we played pomp and cirumstance and Edda got her diploma. Jeremy made lots of food - chicken curry salad, fruit salad, pasta salad and a green salad. We brought ballons and a face painting kit. 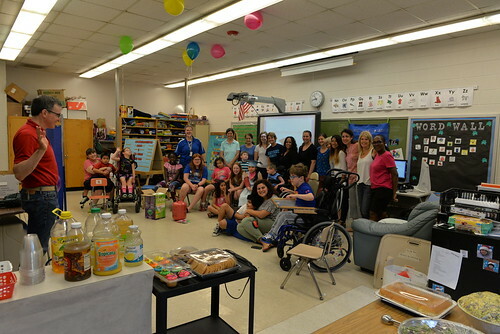 We hung out until the dismissal bell rang. Edda's going to miss her school. 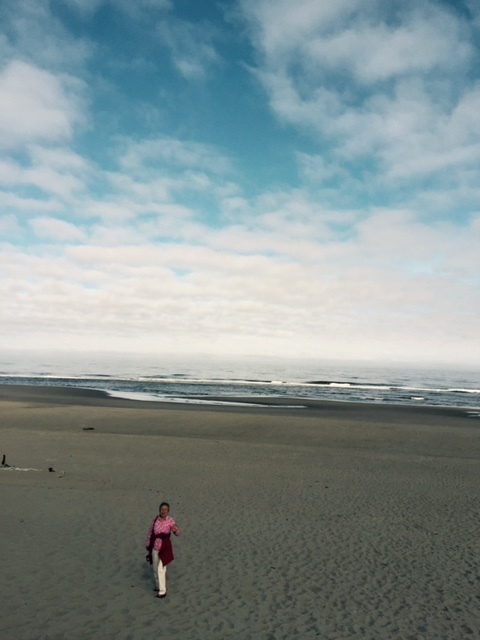 It was a great place for her & a great place for us too!